You’ll find a list of Ray’s daily journal entries here (most recent first) from his journey and since. Click on links for additional details and digital images Ray took on the tour. Scroll down...this is a (50 States) LONG page! 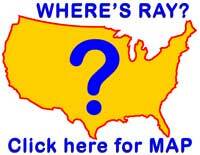 You can also check Ray’s route on our map page. Life happens! Ray crashes his motorcycle in Baja, breaks his neck...and gets...a halo (NO!...not that kind) Then, 3 months later...it happens again? Read details and view image. Tanya Tucker! Ray and Karen take in her concert when she visits Reno. Tanya wants to ride in All50! Read details and view images. 2nd Anniversary: start of All 50 Road Trip! Ray reminisces on his journey, contemplates a new summer road trip and gets the All 50 logo tattooed on his arm! Read details and view images in this journal entry. Ray & Z06 participated in 33rd Annual Black Hills Corvette Classic in Spearfish, So. Dakota. Read details and view images in this journal entry. Classic Chevy's of San Diego invited Ray to join them for a car show at Bob Stall Chevrolet in San Diego. Read details and view images in this journal entry. Ray heads home from Bowling Green after enjoying the 2004 C5 Birthday Bash. Heading back to San Diego is a heckuva drive. Read details and view images in this journal entry. Day trip to Mammoth Caves with Denny & Chris. Tire woes befall ALL 50. More Corvette activities in Bowling Green & C5 Banquet Birthday Banquet. Read details and view images in this journal entry. Bowling Green, KY.. C5 Birthday Bash activities at the National Corvette Museum. The new C6 Corvette unveiled! So is an ALL 50 commemorative brick. Read details and view images in this journal entry. Memphis, TN. to Bowling Green, KY.. Z06 serviced at Chuck Hutton Chevrolet in Memphis. Meeting Karen in Nashville today. Storms continue to accompany Ray through Tennessee. Read details and view images in this journal entry. Stroud, OK. to Memphis, TN. today. Storms continue to be a part of this trip. Tulsa, OK. A scenic drive through the Ozark Mountains. Weather and cool old buildings on a country drive through Arkansas. Read details and view images in this journal entry. Las Vegas, NM. to Stroud, OK. today. Oklahoma City. ALL 50 Z06 turns 30,000 miles! entering Texas. Nasty storms greet Ray in Oklahoma (Thunderstorsm, hail and a TORNADO!). Read details and view images in this journal entry. Holbrook, AZ. to Las Vegas (New Mexico) today. Petrified National Forest. Albuquerque, NM. Fort Defiance. Window Rock. Gallup, NM. Santa Fe., NM. Read details and view images in this journal entry. On the Road Again! After a bowl of Mom’s oatmeal, Ray departs San Diego for the C5 Birthday Bash in Bowling Green. San Diego to Holbrook, AZ. today. Visit with Dad in Borrego Springs. Salton Sea. Phoenix, AZ. Meeting up with Larry, Verna & their '77 Vette.Read details and view images in this journal entry. Ray puts together a “conclusion” journal entry, illustrated with images from the trip’s finale, his 50th Birthday, the trip home and some of what’s been occupying him since. Read details and view images in this journal entry. Ray comes home (finally). The (unofficial) last leg of the journey was the drive down the California coast. Ray met webmaster Edward in San Francisco Tuesday afternoon for the ride down highways 1 & 101...incredibly scenic. No journal or images. Ray’s 50th Birthday! NOW, it can be said that ALL 50 is truly over! Ray turns 50 at his mom’s home in Perham, Minnesota. Karen, his fiancé, who met him in Indianapolis the day before the trip’s end and daughter Amanda who flew out from San Diego are with him along with other family and friends. No journal or images. Ray and Karen spend the weekend enjoying the Corvette Anniversary festivities in Nashville, Tennessee. On Monday, everyone returns to the Corvette Museum in Bowling Green, KY. for the official Corvette Birthday. Read details and view images in this weekend’s journal entry. RAY’S DONE IT!! THE ROAD TRIP IS OFFICIALLY OVER!! Today, Ray, his fiancé Karen and the trusty ALL 50 ZO6 (which has performed its duties like a champ), met an ocean of Corvettes at the Indianapolis Speedway for a ceremonial lap of the legendary “Brickyard,” the start of the “Indiana Caravan,” a 1000-Corvette convoy to The National Corvette Museum in Bowling Green, Kentucky. This afternoon, at 4:21pm EST, Ray pulled up to ALL 50’s starting point, The National Corvette Museum, officially “closing the loop” and ending his journey. Next, it’s on to Nashville for several days of Corvette celebrations and events, back to Bowling Green on Monday, June 30th for the OFFICIAL 50th ANNIVERSARY OF THE CORVETTE!! (Ray wants to thank all of you for following along and supporting his adventure!) Keep checking back, we’ll have more news to come from the celebration AND the trip home to San Diego! No journal yet for today yet...Ray’ll get them sent it in soon, he hopes. He has, however, sent along some images this morning...see them here. Ann Arbor, Michigan to Indianapolis, Indiana. STATE 50 TODAY! Michigan Capitol in Lansing. Fort Wayne, MI. Indiana State Line...that’s “ALL 50”! Visits to ALL 50’s 50th State Capitol, Indianapolis, Indiana including a brief stop at the Indianapolis (“Indy”) Speedway...”the Brickyard.” Karen, Ray’s fiancé’ flew in to join in the last leg of the trip.Tomorrow, Ray’s joining the “Indiana [Corvette] Caravan” at the speedway and “convoying” back to the National Corvette Museum at Bowling Green, Kentucky for the official finale’ and odometer reading! Read details and view images in today’s journal entry. STATE 49 TODAY! Getting sooo close! Dayton, Ohio to Ann Arbor, Michigan. Air Force Museum, Dayton. Columbus, OH. (Rock ‘n Roll Hall of Fame) A brief visit to Gen’l Motors’s Global HQ (will GM finally notice ALL 50?) Michigan State. Read details and view images in today’s journal entry. Clarksburg, West Virginia to Dayton, Ohio. A scenic drive through the back-country of W. Virginia. Charleston, WV. The Ohio River. Read details and view images in today’s journal entry. Niagara Falls, New York to Clarksburg, West Virginia. NIAGARA FALLS and CANADA today! Daughter Amanda’s plane leaves Buffalo this a.m., but there’s time to spend a little time at the great falls and take a little walk into Canada. Lake Erie in Pennsylvania. Pittsburgh, PA. Read details and view images in today’s journal entry. Plattsburg, New Hampshire to Niagara Falls, New York. Ray and Amanda pay a visit to Santa’s Workshop in the North Pole (that’s North Pole, New Hampshire, of course). A beautiful drive through the scenic Adirondack Mtns. Lake Placid and the Olympic Village. State capitol in Albany, NY. Read details and view images in today’s journal entry. RAY AND ALL 50 HIT THE 20,000 MILE MARK TODAY! Skowhagen, Maine to Plattsburg, New York. Ray, with daughter Amanda still riding along arrived in MEXICO today! (er...Mexico, Maine, that is) Errol, NH. The Dixville Notch. The Balsams. Montpelier, capitol of Vermont (state #45...getting close now!) Another ferry ride...this time on Lake Champlain. Read details and view images in today’s journal entry. Manchester, New Hampshire to Skowhegan, Maine. FIRE! in the motel to start the day (all’s well). Ray and daughter Amanda (tagging along) are rousted out of bed by the fire alarm. A little detour to visit Pres. Bush’s retreat in Kennybunkport, Maine. Read details and view images in today’s journal entry. New London, Connecticut to Manchester, New Hampshire. Plymouth, Massachusetts (Plymouth Rock, The Mayflower II) Boston, Massachusetts. Ray’s daughter Amanda joins the road trip in New Hampshire for a few days ride-along. Read details and view images in today’s journal entry. Princeton, New Jersey to New London, Connecticut. ”THE BIG APPLE” TODAY! New York City (Holland & Lincoln Tunnels, “Ground Zero”/WTC Site, Wall Street, The Brooklyn Bridge, Empire State Bldg., Long Island). (Yet another) ferry ride to Bridgeport, Connecticut. Quick visit to Colt Firearms Manufacturing in Hartford, CT.. Read details and view images in today’s journal entry. Philadelphia, Pennsylvania to Princeton, New Jersey. Delaware (Dover Downs, Lewes...”The First Town in the First State.”). A chilly, rough ferry ride to Cape May, New Jersey. NEW YORK CITY TOMORROW! Read details and view images in today’s journal entry. HAPPY FATHER’S DAY! Pocomoke, Maryland to Philadelphia, PA. Visit to Maryland State Capitol (US’s 1st capitol) and the US Naval Academy in Annapolis, MD. Washington, D.C.! (White House, Washington Monument, US Capitol). Shipyards in Baltimore, MD. Riverwalk in Harrisburg, PA. Valley Forge Nat’l Historical Park, Pennsylvania. Read details and view images in today’s journal entry. Wytheville, Virginia to Pocomoke, Maryland. D-Day Memorial on Rte 460, “116th Infantry Memorial Highway” in Bedford, VA. Roanoke, VA. Richmond, VA. Chesapeake Bay. Read details and view images in today’s journal entry. Friday the 13th! Raleigh, North Carolina to Wytheville, Virginia. Great Smokey Mountains...spectacular scenery. Bristol Raceway, Knoxville, TN. Read details and view images in today’s journal entry. Columbia, South Carolina to Raleigh, North Carolina. Darlington Raceway. Myrtle Beach, So. Carolina (The Carolina Opry), Wilmington, No. Carolina (USS No. Carolina Battleship Memorial) Read details and view images in today’s journal entry. Macon, Georgia to Columbia, South Carolina. Atlanta, Georgia. Augusta, Georgia (home of the Masters Tournament at Augusta Nat’l) Read details and view images in today’s journal entry. Cocoa Beach, Florida to Macon, Georgia. Another visit to NASA’s Kennedy Space Center. Daytona Beach, Florida and the famous Speedway (no luck getting on for a lap or two), Okefenokee Swamp (Georgia). Read details and view images in today’s journal entry. Tallahasee, Florida to Cocoa Beach, Florida. Good-bye to Starr after a few days of riding together. Kennedy Space Center (space shuttle, booster rockets) Another visit to a college pal (Byron and his daughters Melissa and Brittany). Read details and view images in today’s journal entry. Jackson, Mississippi to Tallahassee, Florida. THREE STATE CAPITOLS TODAY! (Jackson, MS., Montgomery, AL., Tallahassee, FL.) Ray and Starr (still riding along) find it warm and muggy (in the south?...huh!) A visit to the Hank Williams Museum in Montgomery) Read details in today’s journal entry. Houston, Texas to Jackson, Mississippi. Pal Starr tagging along. Galveston, TX. Ferry ride with ZO6 targeted by sea birds (yuk!). Baton Rouge, Louisiana. New Orleans (Bourbon St. and no time to hang around...bummer). 29 mile long Causeway Bridge across open water. Read details and view images in today’s journal entry. Dallas, Texas to Houston, Texas. Visit to Dealey Plaza & Kennedy Memorial. Visit to Texas capitol in Austin. Visit old buddy Starr, his daughter Caroline, her husband Steve. Starr hops aboard to ride to Florida. A visit to the Alamo. In Houston, a visit to another old pal, Jeff, pro photographer. Johnson Space Center and some pictures of one of NASA’s rockets next to one of Chevrolet’s. Read details and view images in today’s journal entry. Memphis, Tennessee to Dallas, Texas. Another visit to Beale Street (“Birthplace of the Blues”) before leaving. Arkansas (Little Rock, Pine Bluff, Junction City) Hard rain in Shreveport, Louisiana. (Another) visit to Texas (State #6) Read details and view images in today’s journal entry. Chicago, Illinois to Memphis, Tennessee. Both Wrigley & Soldier Fields. State capitol Springfield, IL. Dead end onto the Mississippi River in Missouri. Memphis: Beale St., (BB King’s, Elvis’s, etc.) Read details and view images in today’s journal entry. Green Bay, Wisconsin to Chicago, Illinois. Ray visits Harley-Davidson plant in Milwaukee, gets an impromptu private tour from V.P. of Manufacturing (Thanks, Don!) Read details and view images in today’s journal entry. RAY REACHES THE 1/2 WAY MARK TODAY! Duluth, Minnesota to Green Bay, Wisconsin. Lake Superior. Crossing into Wisconsin, Ray enters his 25th STATE...the 1/2 way mark! He meets with some very young Corvette enthusiasts at the St. Paul capitol and visits the home of the Packers. Read details and view images in today’s journal entry. Ride with Mom to Itasca State Park and the headwaters of the Mississippi River (walks across the Mississippi...wow!) Paul Bunyan and Blue the Ox, in Bemidji, Minnesota. Lake Superior. Leif Erikson Park. Duluth Harbor. Read details and view images in today’s journal entry. Bottineau, North Dakota to Perham, Minnesota. US/Canada border. (International Peace Garden & Sept. 11 Memorial). Fargo, North Dakota visiting Paul, Mary & Katie. Ray visited his hometown, Moorhead, Minnesota and stopped by his old high school. The day ends at Ray’s Mom’s in Perham, Minnesota! Read details and view images in today’s journal entry. Pierre, South Dakota to Botineau, North Dakota. Sitting Bull’s grave on the Missouri River. Bismarck, North Dakota. Garrison Dam and Lake Sakakawea. Minot Air Force Base. Read details and view images in today’s journal entry. Des Moines, Iowa to Pierre, South Dakota. Sioux City. THIRD hail storm of the trip threatens. (whew) Missouri River. Crow-Sioux Reservation. Read details and view images in today’s journal entry. Ray hits 10,000 mile mark of road trip! Hastings, Nebraska to Des Moines, Iowa. Marlene and Dennis’s Car Collection (amazing) in Greenfield, Iowa. John Wayne’s birthplace, Winterset, Iowa. Porky’s Diner and car fiend get-together in Des Moines, IA.. Read details and view images in today’s journal entry. Colorado Springs, Colorado to Hastings, Nebraska - US Air Force Academy. Dodge City Kansas. Read details and view images in today’s journal entry. Memorial Day. Ray and ALL 50 salute all those who have fought and died for our country’s freedom. Sturgis, So. Dakota to Colorado Springs, Colorado - National Black Hills Memorial. Mount Rushmore! RAY GETS HIS FIRST TICKET OF THE TRIP (not for lack of trying!) Bummer. Oregon Trail. Storm in Wyoming (just missing hail). Read details and view images in today’s journal entry. Livingston, MT to Sturgis, So. Dakota - Ray tours the Little Big Horn Battlefield. Spectacular scenery through the Crow Indian Reservation. End the day in Sturgis, South Dakota (H-D territory). Read details and view images in today’s journal entry. Jackson, Wyoming to Livingston, Montana - Chance meeting with editor of Mustang Monthly. Teton National Park. Yellowstone National Park. End of day in Livingston, Montana visiting with Ray’s Uncle Bud, Aunt June and Cousin Jay. Read details and view images in today’s journal entry. Eureka, Nevada to Jackson Hole, WY. Bonneville Salt Flats International Speedway. Mormon Temple, Salt Lake City. Snake River in Wyoming. The Grand Tetons. Read details and view images in today’s journal entry. Reno, Nevada to Eureka, Nevada. Rte 50, “The Loneliest Road.” Desert in bloom, breathtaking scenery. Ray meets Academy Award nominated film-makers. GOLD COUNTRY! Read details and view images in today’s journal entry. Reno, Nevada. Spending the day with fiance’ Karen (long overdue). ZO6 being serviced at Champion Chevrolet. A visit to see Blitzen at school (Ray’s canine pal training at kennels) Read details and view images in today’s journal entry. Boise, Idaho to Reno, Nevada. Ray gets to enjoy some scenic Nevada 2-lane blacktop. A herd of buffalo. A quick visit to the infamous ‘Mustang Ranch’ (no, no...not that kind of visit...the IRS closed it down!). Read details and view images in today’s journal entry. Butte, Montana to Boise, Idaho. Great day on the road! Historic Big Hole National Battlefield Monument, picturesque rivers, mountains and vistas. Read details and view images in today’s journal entry. WSU Campus in Pullman, WA. to Butte, Montana. Lewis and Clark Trail through Idaho. Spectacular river scenery and a flipped over car (not Ray’s). Blizzard in Montana! Read details and view images in today’s journal entry. Tacoma, WA. to Pullman, WA. Ray gets the ZO6 back after its days at sea. Visits Seattle. Stays on WSU Campus with nephew Michael. Read details and view images in today’s journal entry. Montesano, WA. - Still at sister Carol’s waiting for ZO6 to arrive in Tacoma (onboard cargo ship at sea returning from Anchorage, Alaska) Ray’s been busy remapping and scheduling the itinerary for the rest of the trip to make Indianapolis by June 25 to join their Caravan. Read details and view images in today’s journal entry. Anchorage, AK. to Montesano, WA. Ray loads the ZO6 back onto cargo ship and he flies back to Seattle, WA. joining his sister Carol and going on to Montesano, WA.. This completes State #13 of the road trip. Only 37 States more to go! Read details and view images in today’s journal entry. Fairbanks back to Anchorage today. Ray researches and ponders whether or not to drive back from Alaska to lower 48 through Canada...will conditions allow? Read more about it and magnificent Alaska in today’s journal entry. Ray is at Anchorage Port for early a.m. reunion with the ZO6, enjoys a scenic drive to Fairbanks and back. Visits friends, makes new ones...even sees a Moose! (now THAT’s Alaska, eh? Read details and view images in today’s journal entry. Ray flies from Washington State to Alaska to be re-united with his Corvette. Montesano, WA. - Ray still visiting, planning, etc. Ray finds out he’ll have an extra day in Alaska which will allow him to drive up to Fairbanks and visit Denali National Park! Montesano, WA. - Ray visiting with sister Carol and her husband Steve. Ray considering driving back from Alaska (2500 miles) to U.S. to continue on the ALL 50 Road Trip. Redding, CA. to Montesano, WA. Drove through Oregon. Ray visits his sister Carol and her husband Steve in Montesano. Wednesday, he’ll drive to Tacoma, WA. where he will load the ZO6 onto a container ship for its 56 hour boat ride to Alaska! Ray will return to Carol’s to wait and take care of technical and logistical details of the trip. Read details and view images in today’s journal entry. BIG day today! Had ZO6 serviced at Bob Stall Chevrolet. Visited Amethyst and her class at Bird Rock Elementary in La Jolla, CA. (ALL 50’s webmaster is her dad, Edward). Then Ray and his webmaster headed for Los Angeles to ship ZO6 and it’s driver to Hawaii! Read details and view images in today’s journal entry. Heading west I-40. Elk City, OK, National Route 66 Museum. There are several Corvettes parked out front. The group had their cars shipped to Chicago, and were following Route 66 back to California. Good Luck! Amarillo, Texas: Flat and windy! Decide to head north to Sante Fe, New Mexico. Drive downtown on old Route 66 to town square. Stop in Holbrook, Arizona to see the Wigwam Motel. Interesting? On to Winslow Arizona for the night. (Take it Easy......Eagles.) Read details and view images in today’s journal entry. Clear and warm. Oklahoma City. In progress was the Oklahoma City Maraton commemorating the bombing. Federal Building Memorial. Moment of Silence in front of the Memorial. The wall and fence was covered with flowers, flags and messages. The National Cowboy Museum. Worth the visit. Magnificant Indian and Cowboy artifacts, paintings, sculptures, saddles, etc. Read details and view images in today’s journal entry. Clear and warm. Stop by Bud(weiser) for a Quick photo opportunity, heading for Kansas City, KS. Stop in Independence, Missouri to see (pal’s parents) Rosalie and Jack. Then onto to the Harry S. Truman Museum. Stopped in Overland Kansas to try and get some computer help. Heavy rains and hail north of Bowling Green, KY. Dark, Dark cloud outside Paducah, KY, I pulled off highway. Starts to rain heavily, then hail. Pea to small marble size. Fortunately, I was able to find shelter under a motel overhang. It does not appear that there is any damage to the ZO6. I cross the Ohio River into Cairo, Illinois. (State 2). I then cross the Mississippi River into Wilson City Missouri. Rain off and on, heavy at times, all the way to St. Louis, MO. Arrive 7:30pm. Read details and view images in today’s journal entry. Changes in plans (? ): Due to encouragement from all the Corvette folks in Bowling Green (and depending on hotel availability), Ray is considering postponing his departure from Bowling Green in order to enjoy the C5 Corvette Birthday Bash - April 24 thru 26 and would then depart Bowling Green on first day of ALL 50 Road Trip!! Also: Ray’s itinerary has changed further. Seems he’ll have to be in Los Angeles 4/30/03 in order to fly his ZO6 to Oahu, Hawaii!! Museum Delivery of ZO6, Corvette Plant & Museum Tour, National Corvette Museum, Bowling Green, Kentucky. Read details and view images in today’s journal entry. 7:45am - Ray departs San Diego, CA, flying to Bowling Green Kentucky to pick up his ZO6 TOMORROW! Bob Stall has informed Ray that his Z06 has been built on Monday, 4/14 and is being set-up! Gary Cockriel, Guest Services Mgr. at the Corvette Museum has confirmed a 4/23/2003, 7:45am CST delivery of Ray’s ZO6! So mark that day on your calendars as the official start!